A notional NASA concept of a solar-electric-powered spacecraft, designed to capture a small near-Earth asteroid and relocate it safely close to the Earth-moon system so astronauts can explore it. NASA is holding a public workshop on its bold asteroid-capture mission today through Wednesday (Sept. 30 to Oct. 2), and you can watch the proceedings live online. The workshop, which takes place at the Lunar and Planetary Institute in Houston, will discuss the top 96 proposals the space agency received in response to a June request for ideas about how to grab an asteroid and park it in orbit around the moon. You can watch the NASA asteroid workshop presentations at SPACE.com, courtesy of NASA TV. Presentations begin at 1 p.m. EDT (1700 GMT). NASA unveiled the asteroid-capture mission in April. The plan calls for a robotic probe to rendezvous with a near-Earth asteroid in deep space, then drag it to a stable lunar orbit, where it could be visited repeatedly by astronauts for scientific and exploration purposes. NASA is looking to the public and researchers in academia and the aerospace industry to make this ambitious vision a reality, as its June request for ideas shows. The agency received more than 400 proposals in response, and the top 25 percent or so will get an airing at this week's workshop. "The workshop will feature discussions by experts from NASA, the agency's international partners, private industry and the public," NASA officials wrote last week in a media advisory about the workshop. "Topics include how best to identify, capture and relocate a near-Earth asteroid for closer study, how to respond to asteroid threats, as well as partnership, crowdsourcing and citizen science ideas," they added. "Workshop results will be considered for future planning as NASA refines the details of its mission." 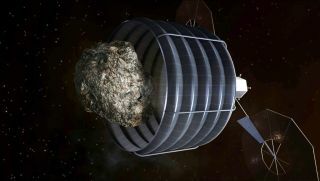 The asteroid-capture mission represents one way to meet a goal laid out by President Barack Obama, who in 2010 directed NASA to send astronauts to a space rock by 2025. NASA will use its Orion capsule and Space Launch System rocket to get them there; the deep-space transportation system is slated to fly crews for the first time in 2021.